​It was announced on Monday that the ​Philadelphia Eagles lost star cornerback Ronald Darby to a torn ACL suffered during Sunday night's loss to the Dallas Cowboys. He was handed the duty of shadowing Amari Cooper for the evening and more often than not, Cooper got the best of Darby. In fact, the footage below suggests that Amari's elusive, crisp route running caused the season-ending injury to the cornerback. ​​The classic curl-and-go route by Cooper absolutely bamboozles Darby. It appears as though the injury took place after Cooper planted and Darby got turned around and tried to recover. 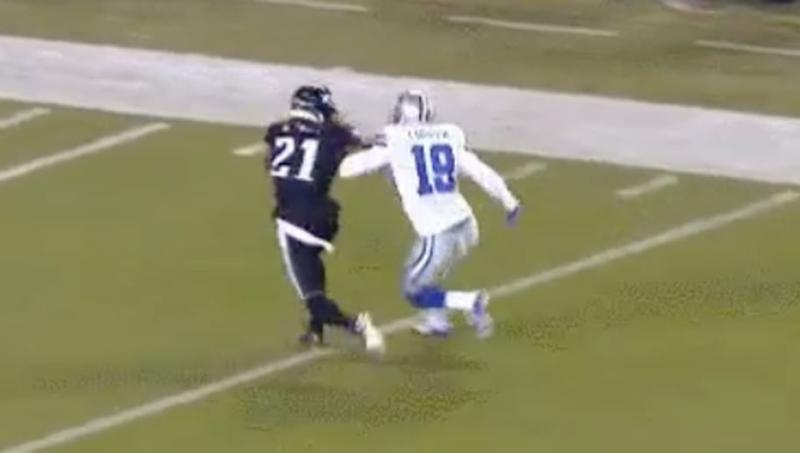 As Cowboys writer Marcus Mosher points out, this is in fact the play where Darby tore his ACL. All football fans love a good juke and/or hesitation move that breaks an opposing players ankles, but not when it results in injuries. ​Philly has suffered numerous injuries to their secondary, but a player of Darby's caliber is irreplaceable. Let's not overlook the sauciness of Amari Cooper, though. He tallied six catches for 75 yards against one of the best of the best defensive backs in the ​NFL...with an average quarterback throwing his way.